1. Promo period is from April 8, 2019 to May 8, 2019. 2. The program is open to all active Mabuhay Miles members. 5. This promo cannot be availed in conjunction with any other Marco Polo Ortigas Manila promotions or discount schemes. 6. Room Stay package redeemed is non-convertible to cash. 7. 48 hours prior reservations is required and subject to availability. Members should call Marco Polo Ortigas at (02) 720 7777 for room reservations. 8. Redeemed Miles can no longer be reverted back to Member’s Mabuhay Miles account. Requests for redemption of Miles must be filed with Mabuhay Miles Service Center (MMSC). Members may visit Mabuhay Miles Service Center or call 855 8888. Members must provide their Mabuhay Miles membership number, mobile number and email address upon redemption. A confirmation message (via email) shall be sent by Mabuhay Miles to Members once Miles have been debited from the account. The email will contain the room type, unique voucher number and authorization code. 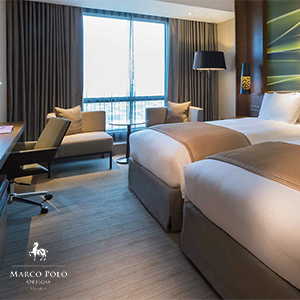 Starting April 15, member should call Marco Polo Ortigas Manila for room reservations. b. Copy of valid government IDs or passport of the member and the authorized person to redeem. Per DTI-FTEB Permit No. 6093, Series of 2019.